For the first time in Plate of Origin’s history, two restaurant partnerships have been named joint winners for 2019. The winning partnerships are Manawatu local, The Fat Farmer and partner Culprit, of Auckland, alongside Nero Restaurant and partner Hopgoods of Nelson. The chefs are Janet Gray of The Fat Farmer and Kyle Street from Culprit; Scott Kennedy of Nero and Aaron Ballantyne of Hopgoods. The winning partnerships have just been revealed in the May edition of Cuisine Magazine which hits shelves this Monday. Plate of Origin is a national culinary competition hosted in Manawatu each year, bringing together some of New Zealand’s finest restaurants, chefs and regional food products. Local restaurants from Manawatu are allocated regions from around the country where they must find a partnering chef and restaurant to collaborate and create one dish, highlighting a hero ingredient from each region. Plate of Origin is managed and delivered by the Central Economic Development Agency, in collaboration with Cuisine Magazine, whose Co-owner and Editor, Kelli Brett, is a judge alongside Chef Lecturer at UCOL, Mark Smith. 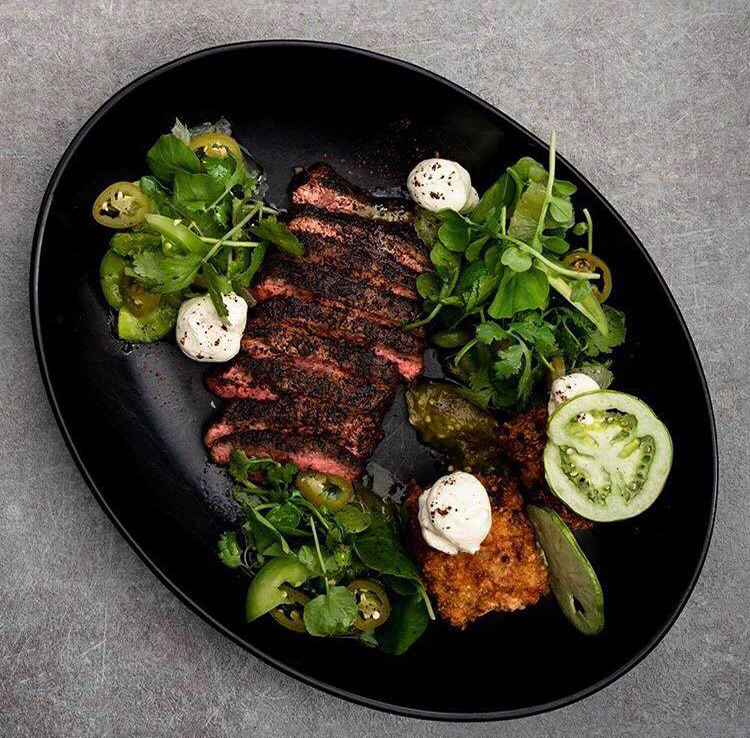 The Fat Farmer and Culprit featured Angus Pure Beef from a selection of Manawatu Angus studs, paired with Curious Croppers green tomatoes from Clevedon, Auckland. 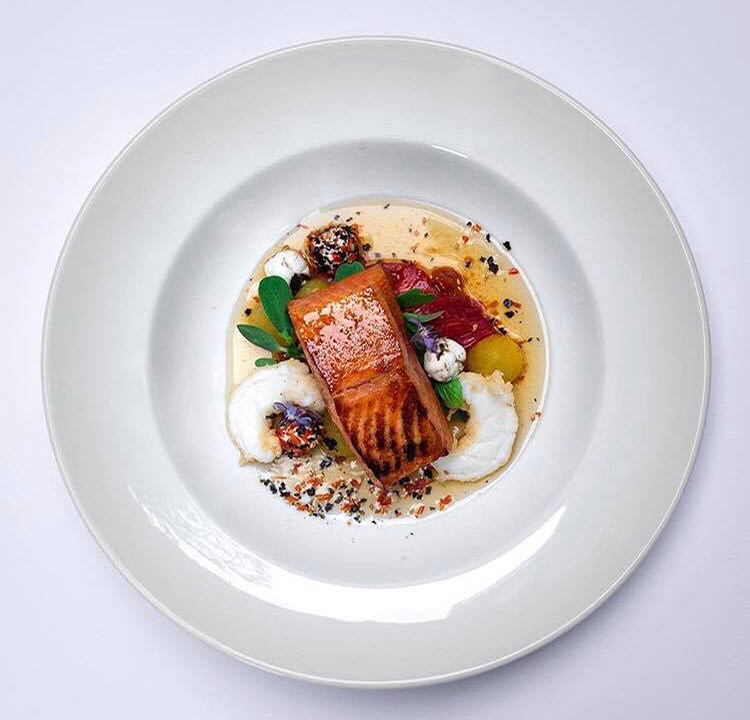 In contrast, Nero and Hopgoods chose Ora King Salmon as their Marlborough and Nelson-Tasman regional highlight, paired with a bespoke goat’s curd by Manawatu’s Cartwheel Creamery, designed especially for the competition dish. Chefs are encouraged to design a dish that remains true to themselves and their clientele, while showcasing new techniques and cooking styles that they have learned from each other. Brett says both dishes were an exemplary reflection of their audience. “The winners really thought through the criteria and had their customers at the centre of their design process. Both partnerships nailed the techniques and flavours. The Fat Farmer’s dish was a great mix of Culprit’s edgy style, with Janet’s take on regional flavours and bringing the farm into the kitchen. It was a clever and great sharing plate, which is at the centre of The Fat Farmer’s offering. Both Culprit and Hopgoods featured the collaboration dish on their own menus. “The most rewarding part of the whole competition is having the opportunity to work alongside another chef to see new techniques, products and find suppliers of new products. It’s always good to win and it’s the final cherry on top because Plate of Origin has so many other positives,” says Nero Owner and Head Chef, Scott Kennedy, who has won two years in a row. Plate of Origin is in its fourth year and has become synonymous with Manawatu. The dishes are available in participating restaurants over two weeks in March and during New Zealand AgriFood Week, providing a crucial link between consumers, chefs, restaurants and regional food producers during the week. The competition is now gaining attention from chefs and restaurants from around New Zealand who are asking how they can be involved, Kennedy says. Diners have a great appetite for the competition, with many trying multiple dishes from their favourite restaurants. He says the two-week period adds a financial shot in the arm for restaurateurs, on top of a busy month. First time winner Janet Gray of The Fat Farmer echoes that working with partner chefs is one of the most rewarding elements of being involved. “This competition provides a rare opportunity to work with some of the country’s most talented chefs. You rarely get a chance to work with or learn from other chefs of this high caliber, no matter how long you’ve been in the industry. Kyle’s style is edgy, and he has a different philosophy. I’ve loved learning about the different products he likes to use. Gray says The Fat Farmer sold 150 of the competition dish, more than ever before. Central Economic Development Agency’s Conventions and Events Executive Phil Hildred says anecdotal evidence from chefs suggests 2019 has been the most successful year yet. CEDA would like to thank Plate of Origin judges, Kelli Brett and Mark Smith for their time and contribution and the 2019 sponsors for their generous support, Visa Wellington on a Plate, Chef’s Choice, Cuisine Magazine and Wharerata. Aberdeen and Mount Bistro | Amayjen The Restaurant and Pacifica Restaurant | Brew Union and Logan Brown | La Patio Cafe and Fleurs Place | Little Savanna andChillingworth Road | Nero Restaurant and Hopgood’s & Co | Nosh Restaurant andPalate Restaurant | The Fat Farmer and Culprit | Wharerata.